June Brides: June is the traditional month for weddings, so throughout the month I wrote about four diverse films that have "bride" in the title. 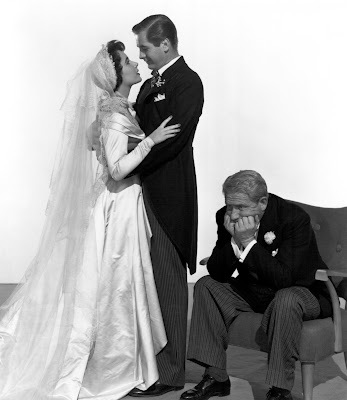 Father of the Bride (1950): Spencer Tracy plays a doting dad who is trying to give his daughter (Elizabeth Taylor) the wedding of her dreams in this classic family comedy. Seven Brides for Seven Brothers (1954): This innovative musical directed by Stanley Donen finds Howard Keel as the head of a pioneer clan of lonely brothers who are looking for some "Sobbin' Women." The Bride of Frankenstein (1935): The monster (Boris Karloff) gets a wife (Elsa Lanchester) in this movie, which is one of the best Universal Pictures horror films of the 1930's. I Was a Male War Bride (1949): This delightful comedy of errors starring Cary Grant and Ann Sheridan was based on a true story.